Share the post "In Memoriam: Daniel Kluchinski (1963 – 2017)"
Daniel Kluchinski, 54 of Rocky Hill, NJ passed away on October 16 with his husband at his side after an incredible fight with cancer. Dan is survived by his husband of 29 years–W. J. “Brad” Bradhering, his parents–Joseph and Florence Kluchinski, his brothers (and sister-in-laws) Dave (Dawn) and Don (Carol) Kluchinski and six nieces and nephews–Joe, Dana, Catherine, Allie, Rachel and Jack. 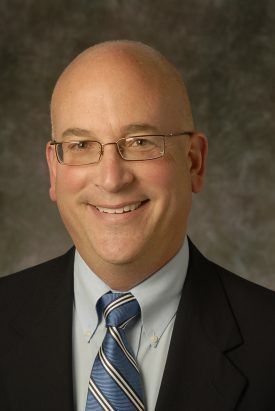 Dan received his undergraduate degree from Rutgers (CC ’85) and his master’s from Purdue University in 1987. He spent his career at Rutgers New Jersey Agricultural Experiment Station as a professor and agricultural agent, originally working in Rutgers Cooperative Extension of Mercer County, and then as Associate Director of Cooperative Extension and Chair of the Department of Agriculture and Natural Resources. Dan was an outstanding scientist, educator, administrator and mentor, and touched and influenced the lives of so many. He had a thirst for knowledge and derived great joy and satisfaction from helping others. Dan was an avid gardener and photographer, loved the beach and ocean and traveling with friends. He always put others before himself and was a devoted uncle, friend, mentor and colleague. His positive attitude, kindness, boundless energy and caring nature will be missed by all those who know and love him. Although his fight with cancer included many challenges, Dan always kept his wonderful smile and sense of humor. His strength, optimism and passion for life and learning were and will continue to be an inspiration. In lieu of flowers, the family would prefer memorial contributions be made to the Dan Kluchinski Memorial Scholarship Fund; c/o Matt Weismantel, Senior Director – Office of the Chancellor, Rutgers, The State University of New Jersey, 96 Davidson Road, Piscataway, NJ 08854-8062. Please make checks out to Rutgers Foundation with “Dan Kluchinski Memorial Scholarship” in the memo. The family would like to express their deepest gratitude for the outpouring of love, support and prayers during his illness—they meant so much to Dan. A “Celebration of Dan Kluchinski’s Life” will be held Saturday, November 18th at noon (doors will open at noon, the Celebration will begin at 12:30 p.m.) in the Kirkpatrick Chapel on the Rutgers–New Brunswick Campus, at 81 Somerset Street, New Brunswick, NJ. The Chapel was one of Dan’s favorite places as a student where he often performed as a member of the Rutgers Glee Club. Some current members of the Glee Club will be in attendance to celebrate his life with song. The Celebration will be followed by lunch (location to be announced). You are welcome to let Brad Bradhering or Thaler Pekar know ahead of time if you would like to speak briefly in celebration of Dan.